Bella Pearl and Rhinestone Bridal Headpiece | Garters & Co.
A beautiful display of delicate, shimmering soft off-white Pearls. The luxurious bridal headpiece is handcrafted into a flowing design and interspersed with bright shining Rhinestones. These Rhinestones have been carefully cut into Navette shapes. They add sparkle and a gorgeous touch of bling for your Wedding Day. 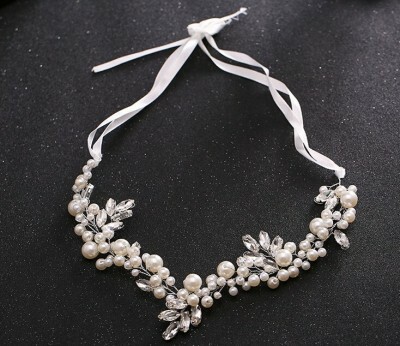 The Bella Pearl and Rhinestone Bridal Hairpiece is 33cm long and approximately 5.5cm in width. A beautiful display of delicate, shimmering soft off-white Pearls. A luxurious bridal headpiece, handcrafted into a flowing design and interspersed with bright shining Rhinestones. All the Rhinestones have been carefully cut into pretty Navette shapes. They will add lots of sparkle and a gorgeous touch of bling for your Wedding Day. Our Bella Pearl and Rhinestone Wedding Hairpiece has been carefully handmade to complement any Bridal Hairstyle. Whether you choose an Updo Hairstyle or choose to leave your Hair flowing naturally. Our Bridal Headpiece is extremely flexible so you can get the perfect shape to sit perfectly in your hair. Your Hairdresser can easily mould this headpiece into any shape to suit whatever hairstyle you choose. Our Bridal Headpiece will create the perfect look for you on your Wedding Day. Each end of the headpiece has long white satin ribbon ties attached. Your Hairdresser may prefer to pin it into your Hairstyle with the special ends looped on the Hairpiece. Be the first to review “Bella Pearl and Rhinestone Bridal Headpiece” Click here to cancel reply.